In reaction to the continually changing business climate companies develop many business strategies to increase their competitiveness and improve profitability. Companies regularly reshape themselves continually exploring new markets and developing new products. When they can't expand into new markets or develop new products on their own, they seek alternatives. These alternatives include merging with or acquiring other companies to create a single more capable company. Companies acquire other companies for a wide variety of reasons. In some cases company survival may actually be the reason. What does this condition mean to the security professional? In the course of mergers and acquisitions, security plays a vital role in helping to make the endeavor successful. There are numerous titles on the business aspects of M&A such as the ones listed below. 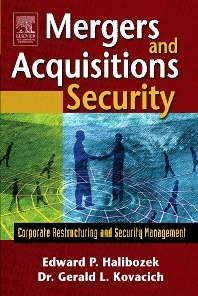 However, this unique book focuses on the role security plays in helping to make a merger, acquisition or divestiture successful. It addresses the fundamental security elements that are required to support the effort. In addition, it provides an integrated "how to" approach to implementing M&A security complete with methods and processes that have been quickly and cost-effectively implemented. Chief Security Officers (CSO's), security managers and security staff involved in a merger or acquisition, Information System Security Officers (ISSO's) and computer security professionals involved in a merger or acquisition, private security consultants. Corporate Executives, HR Managers. What Are Mergers and Acquisitions (M&A)? ; The Current Global Business Environment. Is it Merger and Acquisition Friendly? ; The Role of Security in Mergers and Acquisitions; Gathering Information and Producing Corporate Intelligence; Why Pre-Merger and Acquisition Support? Protecting the effort; Security for the Due Diligence Assessment; Post Merger Security - short term; Post Merger Support - Long Term; Divestitures; The Future of Mergers and Acquisitions Security.